If you've been a long time follower of my blog, thank you so much for your continuous support throughout the six years that I have been sharing my life online. I pour out my heart in every milestone that I've shared on this cyber space where I feel safe and happy most of the time if not all the time. Thank you from the bottom of my heart. You are one of the reasons why I am still blogging. So as my way of thanks, I am celebrating this with a simple giveaway, which I first ran a short and sweet survey among you guys on my Facebook Page. Please do follow if you haven't (Mommy Practicality On Facebook). I am giving away THREE (3) Packages to my lucky followers which will be randomly drawn via Google .Number Randomizer. Comment how many items in total I am giving away (combination of three packages) shown in the photo. Repost the photo with this caption: "I am a loyal follower of @mommypracticality and she's celebrating her 6th year in blogging with a giveaway! A chance to win one of the three packages by guessing how many items in all is she giving away in this photo. Join her celebration giveaway too @TaggedFriend1 @TaggedFriend2. 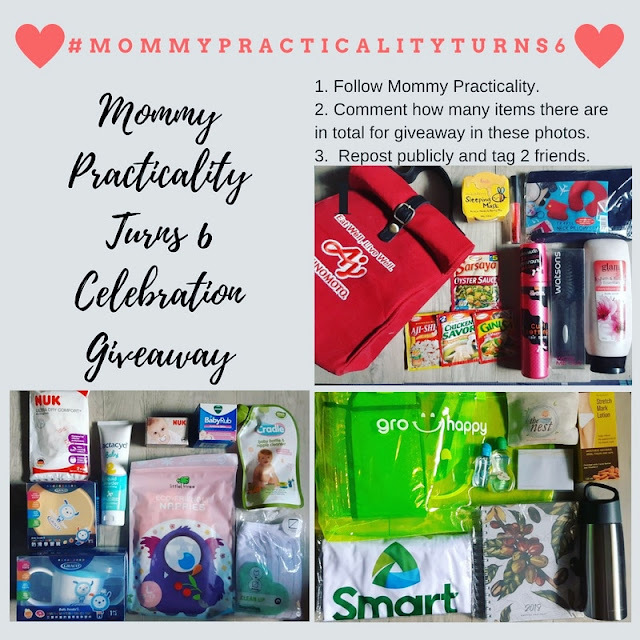 Make sure you include the hashtag #MommyPracticalityTurns6 and make your IG profile public so I may track all your entries. This celebration giveaway is happening until end of August. I will be tracking all Instagram entries using the hashtag #MommyPracticalityTurns6. Each entry (reposted photo) will be given a number. I will select ten (10) Random Numbers with Google's help. Three winners and seven buffers, should first three winning entries be disqualified due to non-compliance, next name/s on the buffer list will be considered. Entry with winning numbers will be strictly validated so please make sure you follow all the mechanics. One more important thing, please make sure you're willing to pick up your prize because I want to meet my readers personally. Prizes may be shipped but on your account. Winners announcement will be done on first week of September. Once again, thank you for keeping up with me for the last six years. God bless everyone!